This Demonstration shows that rhombuses with diagonal ratio are versatile elements for constructing 3D shapes. All rhombuses in this Demonstration have identical side length and a diagonal ratio of . These rhombuses are used to construct 3D shapes. You select a shape family through the "shape" control. 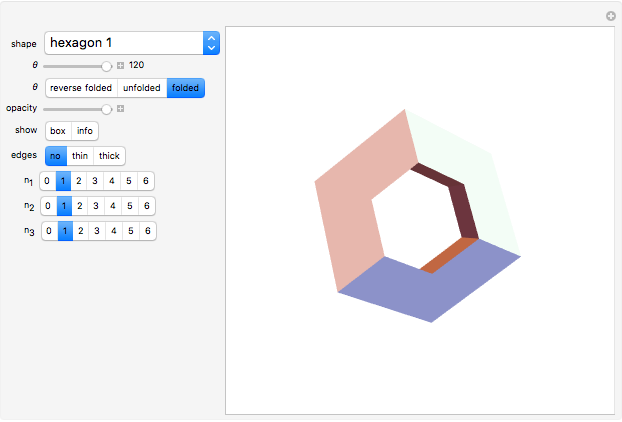 When relevant, controls appear for changing one or more shape parameters. The shapes can all be unrolled into a strip of edge-connected rhombuses. The slider controls the dihedral angle between rhombuses adjacent in the strip: 0 corresponds to no folding, that is, a flat strip. Note that when the strip is fully folded, rhombuses may attach to additional neighbors. In those cases, the dihedral angle can differ from . All shapes (except the rhombic dodecahedron) consist of beams with an equilateral triangle as cross section, connected by regular miter joints. The hexagons and octagons are nonplanar. The helix is an order-four discrete helix, where the third parameter controls the number of full turns. The free-form shape lets you experiment with various beam lengths and their connection. 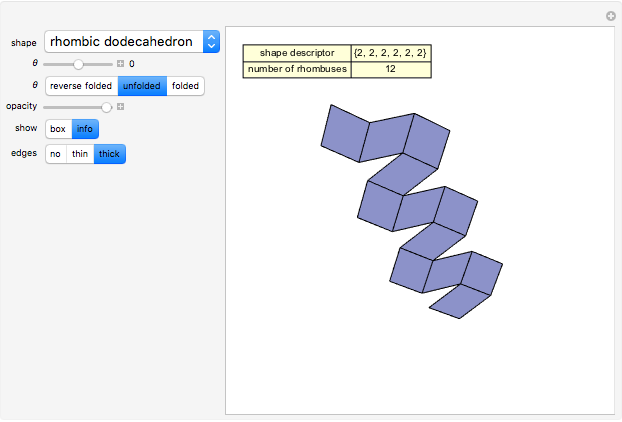 Click "info" to see the descriptor for the rhombus strip and the total number of rhombuses in the shape. For the shapes other than the rhombic dodecahedron, the descriptor lists the beam lengths measured in number of rhombuses. Note that at each directional turn in the strip, half of the turning rhombus counts toward each of the connected ends. Note that a turn also occurs at the initial rhombus of the strip. 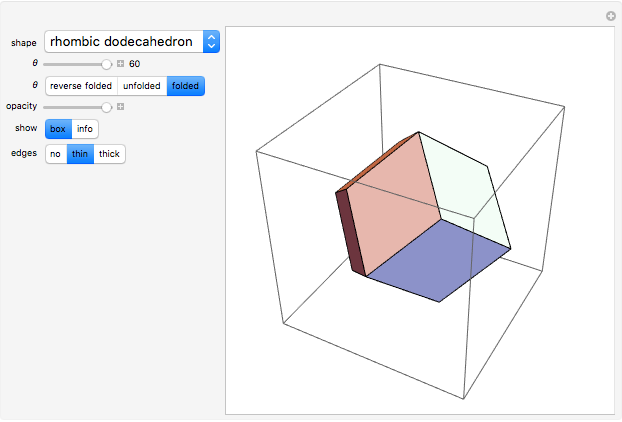 The descriptor for the rhombic dodecahedron involves a slightly different encoding. Edges can be suppressed or emphasized with the "edges" control. When constructing these shapes from physical rhombuses, like Polydron®, it is not necessary to include obscured rhombuses (typically they come in pairs; e.g., Trefoil(0) has three such pairs). Some movies of (un)folding rhombus strips can be found at . T. Verhoeff and K. Verhoeff, "Folded Strips of Rhombuses, and a Plea for the Sqrt:1 Rhombus," Proceedings of Bridges 2013: Mathematics, Music, Art, Architecture, Culture, Enschede, Netherlands (G. W. Hart and R. Sarhangi, eds. ), Phoenix: Tessellations Publishing, 2013 pp. 71–78. T. Verhoeff. "Material for Rhombuses." (Aug 27, 2013) www.win.tue.nl/~wstomv/math-art/sqrt2-rhombuses. Tom Verhoeff "Shapes from Rhombuses"